Offered to the market is this extremely well presented two bedroom mid terrace property in this popular location. The property consists of a separate living room and separate dining room with a re-fitted kitchen that offer access to the rear garden. The kitchen benefits from plenty of cupboard space and space for white goods. Upstairs you will find two double bedrooms and a re-fitted family bathroom. Outside you have a good sized rear garden and also a small frontage. The property would make a fantastic first time purchase or buy to let investment. The property has gas central heating and double glazing. Entrance : , Entered via a uPVC double glazed door straight into the living room. Living Room : 3.7m x 3.7m (12'2" x 12'0"), uPVC double glazed window to rear aspect, radiator. Dining Room : 3.7m x 3.7m (12'2" x 12'0"), uPVC double glazed window to front aspect, with feature fireplace, radiator. Kitchen : 3.8m x 2.3m (12'5" x 7'6"), uPVC double glazed window to side access with door to rear garden, range of wall and base mounted units with roll top work surface, space for white goods, electric oven, gas hob and extractor over. 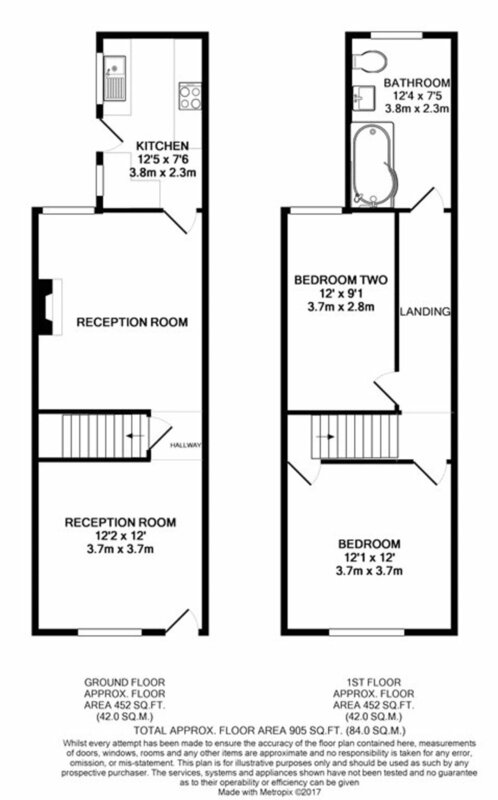 Bedroom : 3.7m x 3.7m (12'1" x 12'0"), uPVC double glazed window to front aspect, radiator. Bedroom : 3.7m x 2.8m (12'0" x 9'1"), uPVC double glazed window to rear aspect, radiator. Bathroom : , uPVC double glazed window to rear aspect, single panelled bath, low level w/c, pedestal wash hand basin. Outside : , Mainly laid to lawn with patio area.